It is 1887. The young colony of New Zealand is in the grip of a deep depression. Insolvent speculators conspire with corrupt politicians while Maori land slips from the hands of its owners. Into this landscape of barely suppressed conflict steps a young Anglo-French-Maori soprano, visiting New Zealand for the first time. Frédérique Bonnell – known to her family as Riki – meets another performer, the Italian tenor Francesco Bartellin. Unofficially, Bartellin has been persuaded to spy on lawyer Thomas Russell and his powerful associates, whose tentacles penetrate the political establishment. Riki is pitched into this treacherous underworld when she witnesses the attempted murder of Kaituhi, a young Maori man apprehended in Russell’s shipboard cabin. Mingling timeless themes of misunderstanding and betrayal, A History of Crime interweaves real and fictional crimes in 19th century New Zealand. It explores the seamy side of Victorian society, with echoes that resonate into the present day. 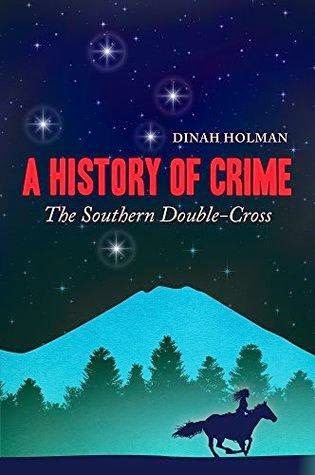 Combining history with mystery and a hefty dose of romance, A HISTORY OF CRIME was both a fascinating and slightly frustrating read. The background to Frédérique Bonnell and her connections to France and New Zealand were unknown territory for this reader - as was the idea that in 1887 New Zealand had financial problems. Needless to say the corrupt land grab and the political and influence corruption behind it was fascinating subject matter for a mystery / crime novel to explore as was the seamy side of Victorian society (as it says in the blurb). Bringing Bonnell, a known soprano back to the country that is a big part of her family origins, is an interesting idea, although events that lead to her being thrown from the ship off the coast, rescuing / being rescued by a Maori man, and ultimately "infiltrating the rich and powerful" alongside the Italian tenor she's teamed to sing with did seem to require some heavy lifting to contrive. Whilst the idea that Bonnell and Bartellin would be mixing in those circles worked, the inclusion of the Maori Kaituhi in the plot served, mainly it seemed, as a conduit for voicing the wrongs. Perhaps that might have worked if it hadn't been for the rather heavy coincidence of just the right Maori man being thrown off the same ship as Bonnell, their survival not discovered, her return to the ship undetected, and then the joint spying and informing activities of all and sundry staying under the radar in a very small place. All of that might have been forgiven but, of course, the two single singers had to fall for each other didn't they. From very early on, their eye-fluttering romance threatened to obscure any of the mystery aspects. Which was muddled even further by much of the history recounting veering into Tell not Show territory a little too often for this reader's personal taste. Of course, readers for whom one or more of these aspects are neither here nor there - if you're a fan of romance for example, or for fiction that occasionally veers into lesson, may find that these minor niggles never appear. The high point of A HISTORY OF CRIME is undoubtedly the sense of place and time that's generated, and whilst the method of historical telling might have been a little heavy-handed, much of it being news to this reader made for very interesting reading. Karen Chisholm is one of the most respected crime fiction reviewers in Australia. An absolute stalwart of antipodean crime fiction, Karen created and has been running her Aust Crime Fiction website since 2006, highlighting a plethora of authors and titles from this part of the world, to the wider world online. It is a terrific resource - please check it out. Karen also reviews for other outlets, such as the Newtown Review of Books, and since 2014 has been a Judge of the Ngaio Marsh Award for Best Crime Novel - the New Zealand crime writing award. Her reviews of New Zealand crime novels will now be shared here on Crime Watch as well as on Aust Crime Fiction.